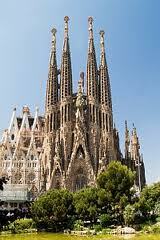 "It is a beautiful church in Barcelona designed by Antoni Gaudi"
-Are you Spanish? = ¿Eres español? -Is she your girlfriend? = ¿Es ella tu novia? -Are they your friends = ¿Son ellos tus amigos? -Are you from Canada = ¿Sois de Canadá? -Is that your car? = ¿Es es tu coche? 1. …………….you Spanish?. Yes, I…………..
2. ……………Susan English? No, she………..
3. …………this your computer? Yes, it …………..
6. Can you call …………(a ella) tomorrow? 10. Can I go with …………..(contigo) to the party? 15. Are you coming with…………..(nosotros) to the party? 1. No estoy en casa en este momento. 2. ¿Estás en el restaurante? No, aún no hemos llegado. 3. Ella no es mi hermana. Es mi prima. 5. ¿Están locos? No, están un poco borrachos. 6. Eres muy guapa como tu madre. 7. Soy profesor de inglés. 11. Estaba en mi oficina haciendo un informe. 15. ¿Estás enfermo? No, Estoy mejor ahora. 16. ¿Sois felices? Si, más felices que nunca. 17. ¿Quieres cenar con nosotros? 19. Estoy seguro que te conozco. ¿Estabas en una conferencia el año pasado? 20. ¿Te apetece jugar al tenis conmigo? Oh, you are my love (x3) " " "
You are my love (Times were getting lonely) " " "
1. I´m not at home at the moment. 2. Are you at the restaurant? No, we still haven´t arrived. 3. She isn´t my sister. She´s my cousin. 4. Are you at home? Yes, I am. 5. Are they crazy? No, they are a little drunk. 6. You are very pretty like your mother. 7. I´m an English teacher. 9. Were you at home yesterday? No, I wasn´t. 10. He isn´t my friend anymore. 11. I was in my office making a report. 12. Are you my friend? Yes, I am. 13. Is Susan tired? Yes, she is. 14. Was it cheap? No, it wasn´t. It was rather expensive. 15. Are you ill? No, I´m better now. 16. Are you happy? Yes, happier than ever. 17. Do you want to have dinner with us? 18. It doesn´t matter. I´ll have dinner with them tonight. 19. I´m sure I know you. Were you in a conference last year? 20. Do you feel like playing tennis with me?